The Short Version: The Reds were down 6-1, scored five runs in the fifth, but an Eric Hosmer homer in the ninth lifts the Padres to the victory. 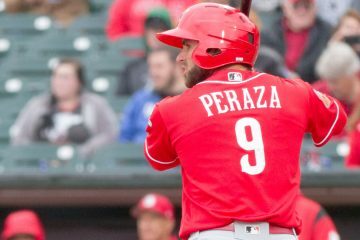 –Jose Peraza continues his hot hitting: 2 for 5 with a double, two runs scored, and two runs batted in. –On his 28th birthday, Billy Hamilton was 2 for 4 with a run scored and his 30th stolen base of the season. 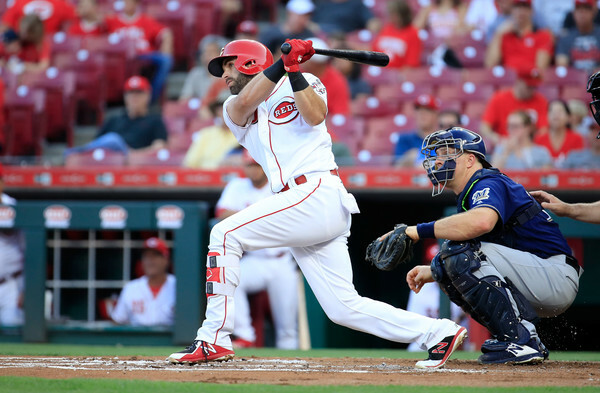 Joey Votto walked…and he also hit a three-run homer. –David Hernandez (2 innings), Jared Hughes, and Matt Wisler combined for 3.1 scoreless innings of relief. –Tyler Mahle struggled with the base on balls again today; he allowed two runs on five hits and three walks in three innings of work. –There will be better days ahead, Lucas Sims. Sims pitched 1.2 innings, allowing four runs on three hits and three walks. –Raisel Iglesias surrendered a solo homer in the ninth that was the margin of defeat. No mention of that infamous bottom of the 8th? Leadoff doubleÃ¢â‚¬Â¦thenÃ¢â‚¬Â¦failed bunt/strikeout, strikeout, fly out. 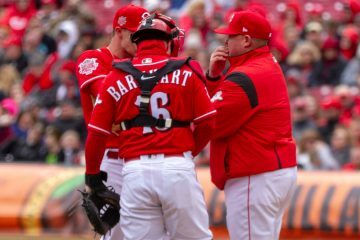 When Barnhart hit the leadoff double, the Reds were 74% favorites to win, according to the FanGraphs index linked up above. If Riggleman is back, I think I am going to start some sort of failed bunt tracker for next season. –Cincinnati very easily could have taken three of four in this series. Instead, it’s a split. Which seems fair, right? –Down 4-0 in the fourth, the Reds scratched a single run across. Peraza singled, advanced to second on a groundout, and scored on Tucker Barnhart’s RBI single. –By the time the Reds batted in the bottom of the fifth, the deficit was 6-1. After batting around, the score was tied. Blake Trahan singled up the middle to lead off the frame, then Billy Hamilton and Scott Schebler singled to load the bases. Peraza doubled to left, scoring two and making the score 6-3. Then Joey Votto homered for the second consecutive game, a three-run blast that tied the game. –Eighteen games to go in the 2018 regular season. Cody Reed will take the hill against the Los Angeles Dodgers tomorrow evening. Joey Votto knocking it over the wall in left center is a good sign. (As if it matters). It matters for next year. What matters is that the Browns are undefeated. Clever with the headline. You really should consider writing a book…maybe even about the Reds. No mention of that infamous bottom of the 8th? Leadoff double…then…failed bunt/strikeout, strikeout, fly out. I intended to mention that. So I updated the recap above. Had the bunt worked, the fly-out would have scored a run. The Red Sox had the same situation, and elected not to bunt, they failed to advance the runner to third as well. But in fairness, the Braves had the exact situation as well, the had Inciarte bunt but he could not get it down and with two strikes swung away and hit a three-run homer. And, of course, the two strikeouts and the fly out played a role in all of this. A big role. Why is it Riggleman’s fault that Williams (and most Reds players) can’t execute the bunt? Bunting down the 3rd base line with a runner on 2nd, no outs, in a tie game IS THE RIGHT PLAY. Just the day before, Harvey’s bunt single was large in the Reds 7 run rally to take control of that game. Would Bryan Price, Dusty Baker, or even Sparky Anderson had Harvey not bunting or Williams not bunting? Had Billy Hamilton been taught to be a proficient bunter before he came to the ML he would be a serviceable cf. Personally, I’m hoping the Reds GM is noting every single failed bunt attempt- & attributing it as a player flaw- not a managerial error. The key to a 7 run rally was a bunt? Giving up an out to then hope for a fly ball is better than letting Williams hit? I understand the game was tied, yet, would not be good to try to score more than 1 run? It is continuing to be shown that sacrifice bunting is not the correct play, with the exception of pitchers. Which should not come into play late in the game. I’m persuaded, generally, that sac bunts reduce the likelihood of scoring. There are situations, though (poor hitter who is a good bunter) where it might make sense. A hit is better, certainly. A double play is much worse. A strikeout or pop-up must be worse, since it doesn’t advance the runner. I agree that the poor bunting can only be laid at Rig’s feet to the extent that he continues to call for bunts when few on the team can execute. The players and the coaches they’ve had all the way back to little league arewhere to point the finger, though it is fast becoming a vestigial skill where it exists at all. You don’t see the difference between Harvey bunting being the right thing and Williams bunting being a right thing? It’s not the failure of the bunt that’s Riggleman’s fault, it’s calling for the bunt. Even if the sacrifice bunt succeeded it would have lowered the Reds run expectancy. The out is worth more than the base. Especially with Billy Hamilton, one of the worst hitters in baseball, coming up next. Williams isn’t a great hitter, but you have to give him the chance to drive in the run there. Preach it Steve.Can someone invite Riggs to the service please?Bunting to set up Billy is just beyond dumb. It won’t be pretty. Rarely works. I hope Riggleman isn’t back for that reason alone. It took 74 pitches for Mahle to get 9 outs. The thing about Riggleman and bunts, while it’s a dumb strategy to begin with, it’s even dumber given this Reds team seems to be collectively horrible at bunting. You’d think if Riggleman intends to use the bunt so much he’d have the practice it enough that they at least become good at it, but using a dumb strategy with players who are incompetent at executing it in the first place is just sheer lunacy. Going to be a long long long winter. It might be, but I won’t know for sure until I’ve seen a few wooly bears, though it’s unclear which color variation signals what. Once it gets cold enough, I’ll start getting interested in the Reds again and working on my optimism. This will be aided greatly by the Browns winning the Super Bowl after an undefeated season, proving the adage about blind pigs and acorns. This was a discouraging game with an inning of fun in the middle. Mahle, Sims and Iglesias all bad. Riggleman worse. But Trahan and Hamilton and Peraza and Schebler and Barnhart and especially Votto made it fun for a while. I didn’t see why Suarez sat out, maybe just a day of rest, but he and Gennett seem a little worn down. Understandable but frustrating. I guess the big takeaways haven’t changed. Add Winker and Senzel and a maturing Ervin and an improving Peraza to a healthy Schebler, the batting leader, RBI leader and OBP leader and you’ll score plenty of runs. But if the Reds can’t find decent starting pitching it’s all for naught. I’m counting on Disco and Castillo, rooting for Reed and hoping for Lorenzen or Harvey and somehow, miraculously, two new pitchers from trades or free agency or the pitching fairy to make this team relevant again. But I’m not holding my breath. Except some of the MLB guys are going to have to be traded for pitching given the quality and quantity they need to acquire. Let’s hope effective due diligence is done on their targets; and, they make wise choices about who to trade so those spots can be filled by the talent pool on hand. It may come down to an MLB level player plus a either Taylor Trammell OR Jose Siri to get 1 pitcher of the quality they seek. And Siri was hurt the first 2 months of the season and didn’t have the follow up year on 2017 that many expected. Trammell was down most of August with injuries. Shed Long had a great first half, and an equally bad second half. That puts the trade target squarely on the back of Tony Santillan, who Doug Gray just listed this morning as his Reds Minor League Player of the Year. I don’t think the Reds should entertain the thought of trading Santillan this winter. And all of that is going to limit who the Reds can trade this winter and who they can trade for, when 6 of the top 8 prospects have health or slump issues. I agree about Santillan, WV. I think there are four guys nearly untouchable – Santillan, Greene, Senzel and India. I say nearly because even three of those four could make a big difference down the road. But only one could be traded before you start mortgaging the future. And based on this year’s results, on health concerns, and on the Reds need for pitching I think Santillan is the last guy I’d give up from that list. Jim I agree. I don’t think the Reds can keep all those hitters any more than I think the pitching fairy will bring them an ace. But I think Gennett should be traded, and the Reds don’t seem to value Herrera (how did Dixon start at 2nd instead of Dilson this weekend? ), and one or more of Ervin, Schebler and Hamilton are all available. Add in the prospects: Siri, Trammell, Long and Stephenson at least, and maybe a major league reliever or two and there are bargaining chips at hand. Develop one more: Reed, Sims, Wisler? Sign one more: Harvey or… ? Trade for one more: How much would the Reds give up? That seems plausible without serious damage to the offense. But will the front office have the vision and the nerve? I have found myself wondering what team is going to be willing to trade any starting pitcher that has a record of consistent effectiveness. Good starting pitching is the gold standard of MLB assets. That’s what I’m afraid of, too. Have to look for rebuilding teams with guys under control for a shorter length of time than a rebuild should take. Syndergaard (etc) of the Mets, Stroman of the Jays, Fulmer of the Tigers and so on. IÃ¢â‚¬â„¢d certainly call about Snell but have no inkling of the Rays plans. DonÃ¢â‚¬â„¢t know whoÃ¢â‚¬â„¢s worth checking in on the Royals, Orioles, Rangers, Marlins etc but they should check in with those teams as well. Other than prime prospects like Senzel, India and Greene, the Reds do not have many players to trade who would bring a solid starting pitcher or two. The only other avenue is spending money and that’s on the ok of ownership. The Latos trade demonstrated what a true difference maker, potential #1 market was 6-7 years ago. I don’t think the Reds should go there at this point because too much else is still unsettled as opposed to back then when Latos was clearly a finishing piece. I think the best the Reds could do now is to go for a solid middle of the rotation guy young enough and with enough team control and ceiling potential remaining to perhaps grow into a borderline #2. I believe Latos had three years of team control at the time he was acquired. I would not trade a package like the one for Latos for a pitcher with any less than three years of control. You look at what all 4 of those guys did after they were traded for Latos and it is pretty hard to justify another such deal unless the Reds were back in a position where they were absolutely set position wise and needed the pitcher to hopefully put them over the top as a WS competitor. That’s where they were when the Latos deal was made and we all know how painfully close but not quite they came. This said, think what a difference it might, might, have made to have had one of those guys still around to seed the current rebuild with prospects in 2014. What could the Reds send the LA Angels for LHP Andrew Heaney? Angels need some holes to fill at the ML level with most of their best prospects 2-3 years away or longer. They want to compete in the tough AL West next year and quit wasting their Trout years. They have a big hole at 2B and 3B with Cozart penciled in at one. They need a RF in a big way. A 1B wouldn’t hurt. But they also need pitching. So would they dare trade pitching to fill 2 holes AND get more pitching back in return? Stephenson and Herrera with changes in scenery might flourish there. And both out of options helps the Reds, but likely won’t have an effect with LA. Ervin or even Schebler would be a nice fit in RF for them. RHP RStephenson, OF Phil Ervin, 2B Dilson Herrera, and RHP Lucas Sims for LHP Andrew Heaney. Barely touching the farm with including Sims for the Reds. Angels get a lot of team control with ML ready players, and don’t have to spend big on the free agent market saving budget room for a Trout extension. If I’m the Angels, I don’t hang up on that deal. I’d have to strongly consider it. If I’m seriously trying to compete though I’d have a hard time giving up a proven SP in Heaney. Giving up Ervin, Herrera and Sims may be tough for the Reds but the Reds don’t seem to think Herrera is as good as I think he is.